by Chris Woodford. Last updated: November 3, 2018. Trains that float, faster computers that can store more data, and electric power that zaps into your home wasting less energy are just a few of the benefits promised by superconductors—materials that offer little or no resistance to electricity. You're probably used to the idea that conductors (such as metals) carry electricity well, while insulators (such as plastics) barely let it pass through them at all. But how much do you know about superconductors that eliminate resistance almost entirely when you cool them down to very low temperatures? Let's take a closer look! Photo: The Meissner effect: this tiny ceramic "floats" on a magnet because it's acting as a superconductor. We explain how this works in more detail below. Photo courtesy of Brookhaven National Laboratory and US Department of Energy. It's a little bit misleading to divide materials into conductors and insulators. It's much more accurate to say that all materials conduct electricity, under the right conditions, but some conduct more easily than others. When we say a metal conducts electricity well, we really mean it offers little or no resistance when you try to make a current flow through it; when we say plastics insulate well, we're actually saying that they put up high resistance to electric currents. Resistance is often a much more useful concept than trying to divide materials into "conductors" and "insulators". One of the interesting things about resistance is how it changes as you change the temperature. Suppose you have a piece of gold wire in an electrical circuit. Gold is one of the best conductors there is: it shows very little resistance to electricity. But increase its temperature and it puts up much more resistance. Why? Broadly speaking, the higher the temperature, the more thermal vibrations there are inside the gold's crystalline structure and the harder electrons (the negatively charged particles inside atoms that carry electric currents) will find it to flow through. Conversely, if you cool gold down, you reduce the vibrations and make it easier for electrons to flow. 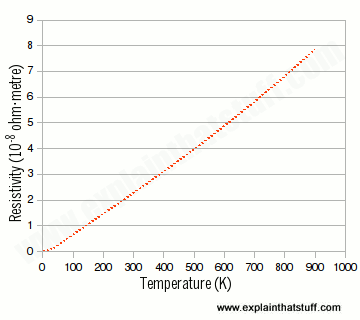 Chart: The resistance of gold is directly related to temperature: the hotter it gets, the more it resists electricity. As we approach absolute zero (0K), the resistance falls almost to zero—which leads us to the idea of superconductivity. Chart plotted using data quoted in Resistivity of Gold, with original data from "Handbook of Chemistry and Physics" (75th Edition) by David R. Lide. New York: CRC Press, 1996–1997. Now this is a somewhat simplistic explanation because several different mechanisms cause resistance and they become more (or less) important at different temperatures. At low temperatures, for example, impurities and defects in the material cause most of the resistance. A fairly complex mathematical equation called Matthiessen's rule lets you figure out the total resistance of a material at any given temperature by summing the various effects. But that's much more detail than most of us want or need to know. I survived my physics degree without learning Matthiessen's rule—and you can almost certainly manage without it too. If resistance increases when you heat metals and falls off when you cool them, any scientist worth his or her salt is immediately going to wonder what happens if you really—and I mean seriously—cool a metal. Many have considered this, but the first person to really probe the issue, in 1911, was a Dutch physicist named Heike Kamerlingh Onnes (1853–1926). When he cooled a wire made of mercury to the toe-tingling temperature of −269°C (−452°F or 4K), Onnes found that its electrical resistance suddenly disappeared. In other words, he'd discovered superconductivity. But it was a fairly fleeting effect. Onnes found that if he applied a strong magnetic field to his mercury, the superconductivity vanished as quickly as it had arrived. Animation: The Meissner effect (also called the Meissner-Ochsenfeld effect). You can make a cooled superconductor (light gray, above) float and even spin above a permanent magnet (dark gray, below). 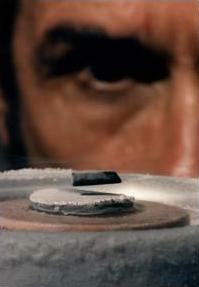 The superconductor "diverts" (excludes) the magnetic field (red) from the magnet and levitates in mid-air. We call materials superconductors because of their "super" ability to "conduct"—but it's probably not the best name we could have given them—superconducting is not the only special thing they can do. Following Onnes' amazing discovery, it took another 20 years or so before two German physicists, Karl Meissner and Robert Ochsenfeld, found that superconductors have another amazing trick up their sleeves. A superconductor is diamagnetic: it refuses to let magnetism penetrate inside it. How does that work? Stand a superconductor in a magnetic field and you'll make electric currents flow through its surface. These currents create a magnetic field that exactly cancels the original field trying to get inside the superconductor and repelling the magnetic field outside. This is known as the Meissner effect and it explains how you can make a superconductor levitate (float) in a magnetic field. You have to be brilliant to win a Nobel Prize in Physics—it's the world's top science award. But imagine how utterly, stupendously, amazingly brilliant you need to be to scoop two of these prizes. That was the achievement of American physicist John Bardeen (1908–1991). He won his first prize in 1956 (with Walter Brattain and William Shockley) for inventing the transistor (a tiny amplifier and switch that revolutionized electronics and computing). But he won a second prize almost three decades later, in 1972 (with Leon Cooper and Robert Schrieffer), for developing the best theory we currently have of how superconductors work. Artwork: Superconductivity happens when electrons work together in Cooper pairs. Called the BCS theory in honor of its three discovers, it explains that materials suddenly become "superb conductors" when the electrons inside them join forces to make what are called Cooper pairs (or BCS pairs). Normally, the electrons that carry electricity through a material are scattered about by impurities, defects, and vibrations of the material's crystal lattice (its scaffold-like inner structure). That's what we know as electrical resistance. But at low temperatures, when the electrons join together in pairs, they can move more freely without being scattered in the same way. Not all materials show superconductivity. Apart from mercury, the original superconductor, you can find the effect in about 25 other elements (mostly metals, semimetals, or semiconductors), though it's also been discovered in thousands of compounds and alloys. Each different material becomes a superconductor at a slightly different temperature (known as its critical temperature or Tc). The trouble with most of these materials is that they superconduct only within a few degrees of absolute zero (the lowest theoretically possible temperature: −273.15°C, −459.67°F, or 0K). That means whatever benefit you gain from their lack of resistance, you probably lose from having to cool them down in the first place. The idea of a power plant that gets electricity to your home down superconducting wires sounds brilliant: it would save huge amounts of wasted energy. But if you had to cool large parts of the plant and all the transmission wires to absolute zero, you'd probably waste far more energy doing that than you'd ever save from having no resistance in the cables. This is largely why superconductors have yet to make a really big impact on the world, despite being discovered almost a century ago. For many years, scientists assumed superconductivity could happen only at very low temperatures. Then, in 1986, two European scientists working for IBM, German physicist J. Georg Bednorz (1950–) and Swiss physicist K. Alex Müller (1927–), discovered a ceramic cuprate (a material containing copper and oxygen) that could became a superconductor at much higher temperatures (−238°C, −396°F, or 35K). Other scientists have since found materials that show superconductivity at even higher temperatures and the record is currently held by a material called mercury thallium barium calcium copper oxide (Hg12Tl3Ba30Ca30Cu45O125), which superconducts at −135°C (−211°F or 138K) and was patented by Korean scientists in 1996. The discovery of so-called high-temperature superconductors (HTS) moved research on enormously. The original superconductors needed temperatures within a whisker of absolute zero—and you can reach those only by cooling materials using an expensive coolant gas such as liquid helium. But the high-temperature superconductors (that's relatively high, not absolutely high—remember we're still well below minus 100 Celsius and minus 200 Fahrenheit!) can be cooled using liquid nitrogen instead, which is about 10 times cheaper to produce. A lot of applications that weren't economic suddenly became a whole lot more practical when high-temperature superconductors were discovered. Superconductivity sounds cool, if you'll forgive the pun, but is it anything more than a neat physics party trick? Yes, and for the very simple reason that much of the stuff that makes our modern world go round is either electric, magnetic, or both—and superconductivity can, theoretically at least, make almost any electromagnetic device work more efficiently. With the exception of heating elements, which use the resistance of a wire to turn electrical energy into heat, most electric things get no benefit from resistance whatsoever. It makes computers hot and slow, runs batteries flat, burns out lamps, wears electric motors out before their time, and, all told, is one of the biggest reasons why our electricity bills are higher than they need to be. Fortunately, superconductors are starting to change things for the better, albeit extremely slowly. It's not surprising that low-temperature superconductors (LTS) are currently used much more than high-temperature superconductors (HTS), simply because they've been around longer, are better understood, and (for various reasons) are usually easier to put to practical use. In the future, however, as scientists figure out how to achieve superconductivity at higher temperatures, in a wider range of materials, HTS is likely to become an increasingly exciting and lucrative technology. But that's enough about tomorrow—what's happening today? 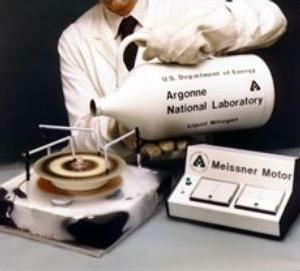 The most widespread practical use for superconductors at the moment is in body scanners, based on a cunning bit of science called NMR (nuclear magnetic resonance). When we direct an intense magnetic field at an atom, we can make its nucleus resonate (wobble about) and give off radio waves, just like a wine glass vibrates and "sings" if you sing near it at just the right frequency. In a body scanner, superconducting magnets make the powerful magnetic field, which causes atoms inside the patient's body to give off radio waves. As the scanner spins around, it picks up these waves and turns them into an image of what's happening inside the patient's body, much as a radio telescope picks up patterns of radio waves to draw pictures of distant galaxies. This is called magnetic resonance imagery (MRI) and it currently uses low-temperature superconductors. 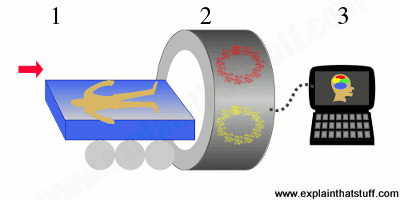 Artwork: How an MRI scanner works. The patient lies on a platform (1) that moves into a huge ring containing the scanning equipment. The scanner (2) beams energy into their body, causing the atoms inside it to vibrate and give off radio waves. These are picked up by the scanner and turned into an image on a computer screen (3). Thanks to the huge worldwide interest in CERN's Large Hadron Collider (LHC), superconducting magnets are now well known for their role in particle accelerators. If charged particles (like bits of atoms) move through a magnetic field, they bend round in a curve. We can use this to accelerate them to incredibly high speeds and energies so, when they collide, they smash apart and generate new particles that help to reveal the deeper structures from which atoms are built. The LHC, for example, uses over 1000 magnets made from a niobium-titanium alloy (Nb-Ti) cooled almost to absolute zero (also types of low-temperature superconductors). The magnetic field they produce measures 8.3 T (tesla), which is over 100,000 times greater than Earth's magnetic field. Engineers have been promising us floating trains that use magnetic levitation ("maglev") since at least the 1960s. One reason they've yet to take off (literally and figuratively) is that it's expensive and difficult to make conventional electromagnets that can lift a train into the air. Despite fervent research, maglev technology has barely made any impact on railroad travel so far. One exception is the Japanese SCMaglev system, which uses superconducting magnets to float trains and speed them along at up to 603 kph (375 mph). You can read more about this in our main article on linear motors (which includes a box about Maglev). 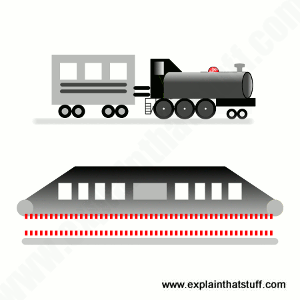 Artwork: Traditional trains (above) run down rails on wheels; maglev trains (below) float above the rails on a magnetic field (red) produced with superconducting magnets. Maglev technology would be much more practical if superconductors worked at higher temperatures. Resistance certainly has its uses, but when it comes to making, transporting, and using electricity, it's very much the enemy: it's one of the reasons why a mere 20 percent of the energy in a fuel like oil or coal, burned in a power plant, actually does useful things inside your home. Resistance explains why electricity has to be zapped along powerlines at such high voltages, making transmission much more difficult and dangerous than it would otherwise be. That could all be about to change. The basic technology we've been using to produce electricity is pretty much the same as it's been since the time of Edison and Tesla, at the end of the 19th century, but utility companies are now experimenting with both low- and high-temperature superconductors to make generators, powerlines, transformers, and power storage devices like flywheels that waste considerably less energy. And it's not just generators and powerlines that stand to benefit. Electronic devices use much smaller amounts of electricity, in what we might describe as a more "thoughtful" way. The flow of electrons isn't designed to carry energy, as such; rather, it's controlling things, timing other things, making decisions, or storing information. Here, too, superconductors have their uses. Computer designers, for example, have long been experimenting with devices called Josephson junctions, based on an effect discovered in 1962 by physicist Brian Josephson, where electrons "tunnel" from one superconducting material to another through a thin barrier made of a material that isn't superconducting. Josephson junctions have been used to make ultrafast logic gates and extremely sensitive magnetism detectors called SQUIDs (Superconducting Quantum Interference Devices), which are finding their way into all kinds of things from improved MRI brain scanners to super-sensitive submarine detectors. The Nobel Prize in Physics 1972: Discover how John Bardeen, Leon Cooper and Robert Schrieffer won the prize "for their jointly developed theory of superconductivity, usually called the BCS-theory". Absolute Zero: PBS Nova has an excellent site about the quest to reach super-cool temperatures. The Path of No Resistance: The Story of the Revolution in Superconductivity by B. Schechter. Simon and Schuster, 1989. Absolute Zero and the Conquest of Cold by Tom Shachtman. Houghton Mifflin Harcourt, 2000. Why Things Are the Way They Are by B.S. Chandrasekhar. Cambridge University Press, 1998. Chapter XII "Superconductors", p.216, gives a much more detailed (but still relatively accessible) explanation of the physics behind superconductivity, including Cooper pairs and the Josephson effect. A good place to go next after reading my article. Superconductivity by Vitaliĭ Lazarevich Ginzburg and E. A. Andryushin. World Scientific, 2004. A good introductory text for high-school and college students and general adult readers with some scientific background. Superconductivity: An Introduction by Rheinhold Kleiner and Werner Buckel. Wiley-VCH, 2016. Superconductivity by K. H. Bennemann. Springer, 2008. A definitive two-volume reference, with an emphasis on high-temperature superconductors. Tool Reveals Mechanism Behind High-Temperature Superconductivity by Dexter Johnson. IEEE Spectrum, 6 July 2017. Stanford scientists investigate if their new understanding of atomic vibrations could lead to higher-temperature superconductors—perhaps even, one day, at everyday, room temperature. Physics Nobel Work Is Leading to Improved Superconductors by Andrew Silver. IEEE Spectrum, 7 Oct 2016. Nobel-Prize-winning research is helping to shed light on high-temperature superconductivity. Superconductivity's First Century by Pradeep Haldar and Pier Abetti. IEEE Spectrum, 28 February 2011. How superconductivity has revolutionized medical imaging. Frozen Puck Hovers Over Track Using "Quantum Levitation": Wired, 18 October 2011. An impressive new demonstration of the Meissner effect by physicists at Tel Aviv University. Superconductors Face the Future: LBL News, 10 September 2010. Explores how superconducting magnets were developed for the Large Hadron Collider (LHC). 'Enormous potential' for superconductors : BBC News, 9 July 2010. An audio interview with Professor David Cardwell of Cambridge University describes a new generation of high-temperature superconductors that can produce much larger magnetic fields. The high times of physics revisited by Paul Grant. BBC News, 5 March 2007. Recalls the excitement among the physics community following the discovery of high-temperature superconductivity in the 1980s. Living up to the Hype: Superconductors: NASA Science News, 5 February 2003. Explains how NASA research is unlocking the amazing potential of high-temperature superconductors. They're a Puzzle, but They Work by Keneth Chang. The New York Times, May 29, 2001. Why is it proving so hard to explain high-temperature superconductivity? Out of the Freezer, Into the Fire by Michael Gunn and Joanne Porter. New Scientist, June 23, 1988. A simple explanation of high-temperature superconductors from the time of their discovery. Superconductors: Scientists Hail Latest Materials by James Gleick. The New York Times, March 8, 1988. This old article from the NYT archive conveys the buzz of excitement the scientific world experienced when high-temperature superconductors were first revealed in the mid/late 1980s.